The collection of early Hawaiian printing at AAS is one of the strongest institutional collections of Hawaiiana outside of the islands, and it continues to grow. Highlights include Hawaiian language imprints, bibliographies, hymnals, maps, primers, newspapers, periodicals, and engravings. 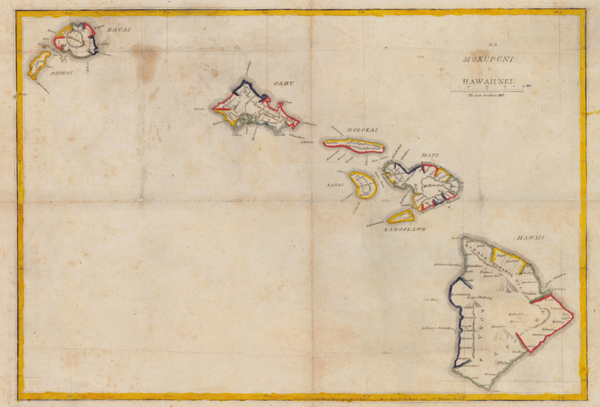 At the core of the Society’s collection of primary source material on Hawai‘i is the collection of over 200 books and pamphlets written in Hawaiian and other Polynesian languages, and approximately 300 titles printed on the islands themselves between 1822 and 1876. AAS holds a copy of the earliest printed pamphlet, The Alphabet, printed in O‘ahu on the Mission Press in January 1822. All told, the collection of books and pamphlets on nineteenth-century Hawai‘i held at AAS number well over a thousand volumes. Of equal importance to the collection is the broad array of newspapers and periodicals originating in the Hawaiian Islands. There are twenty-two English and sixteen Hawaiian-language titles in this collection, with a total of over 2,600 individual issues. A small but important highlight of Hawaiiana at AAS is the Hawaiian engravings collection, consisting of twenty-eight separately published prints produced by students at the Lahainaluna School on the island of Maui. The collection of Hawaiian materials at AAS began with the nineteenth century gifts of Rev. Samuel C. Damon, the noted American Congregational missionary. A further major addition was made in 1937 with the purchase of the Hiram Bingham Library, an acquisition made possible through the interest and generosity of two descendants of some of the first American residents of the islands, Foster Stearns and James M. Hunnewell. Much of the strength of AAS’s Hawaiiana collections is directly attributable to the generosity of the Hunnewell descendants up to the present day. In 2008, the most recent generation gave an additional collection of forty choice volumes some so rare as to be virtually unobtainable in today’s market. In 2016, a donation of material related to James Frothingham Hunnewell—including a significant cache of manuscripts —served to illustrate how he built his collection of Hawaiiana and other books, many now at AAS. The Society continues to actively acquire early Hawaiiana as it becomes available. Almost all Hawaiiana holdings have a brief record in the General Catalog. Approximately 200 post-1840 imprints remain uncatalogued.